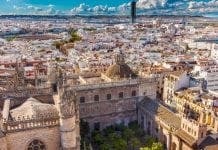 GRANADA in July can get pretty hot, with temperatures climbing up to 40 degrees in the afternoon. Despite these almost unbearably high temperatures, tourists still flock to the Alhambra palace – Spain’s number one visitor attraction – by the thousands. First and foremost, don’t just turn up. If you want to visit the heart of the palace, I strongly suggest you buy tickets in advance, as by the time you get there they will almost certainly be sold out for that day. We visited on a Sunday morning – booking a week ahead for €14.50 per person. When we visited there were more than 600 people scheduled to visit in the 8am – 2pm slot, and almost three times that many scheduled to visit during the later hours. To avoid both the heat, and the crowds of the afternoon, we signed up for an 8:30am tour. I will be honest – it was difficult to rouse ourselves, but we were not disappointed. Walking up the tree-lined pathway, just as the sun was rising, was an incredible experience. The fortress is divided into four sections: the Alcazaba, the Palacios Nazaries, Charles V’s Palace, and the Generalife Gardens. It was the Palacios Nazaries that I found most amazing. These Moorish palaces are disarmingly beautiful and it is hard to imagine how much time and talent it must have taken to create them. Wandering through the fortress and gardens, we were astonished at every turn by the intricacy and beauty of what we saw. It’s possible to buy an audio guide or to join a tour (available in a multitude of languages) but we decided to wander on our own. We may have missed out on some of Alhambra’s history, but there were signposts everywhere directing us on where to go as we walked for hours, and we were able to take in all the beauty unburdened by a tour group or clunky audio equipment. Near the end of our visit, we went to the Alcazaba, the Alhambra’s oldest section. We stood at the top of the tallest tower and looked across the city to St. Nicolas Viewpoint, where we had been just the night before. It was amazing to imagine people thousands of years ago standing at the same point to watch for attacks from below. We finished our tour in just under three hours, right as the sun was getting hot. As we walked back down to the city, through the trees and tiny bubbling fountains, I was convinced I’d never seen anything so beautiful. We’ll be there in a month. When I bought our tickets online—3 (!!!!!!) days after they went on sale—there were only 20 tickets left for our time block. So yes, buy them early. Anyhow, thanks for the article. We’re looking forward to seeing it.